Ambulances are the agency’s primary response vehicles, and the sole means by which we transport patients to local emergency departments. 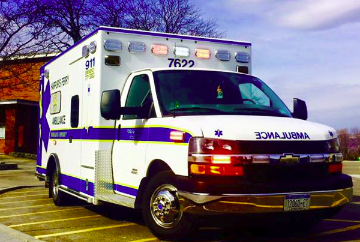 Each of our ambulances is fully staffed at the advanced life support level. Additionally, each ambulance is equipped with powered stretchers for patient comfort and crew safety and the latest in safety features for safety in response and on scene operations. 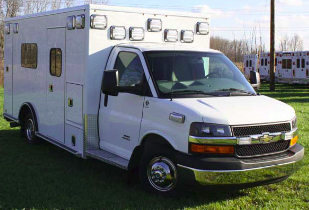 7621 is a 2009 Chevy 4500 Duramax Medix Type 3 Ambulance. 7621 was put in service in December of 2009. 7621 had minor graphics upgrades in 2012 to match the updated paint scheme with the purchase of 7622. 7622 is a 2012 Chevy 4500 Duramax RoadRescue Type 3. 7622 was put in service January 2013 and is dedicated in honor of the late Major John Pryor, MD, a Harpur’s Ferry Alumnus who died in the line of duty in Mossul, Iraq on December 25, 2008. 7623 is a 2016 Chevy 4500 Duramax RoadRescue. 7623 is set to be placed into service in March of 2016. 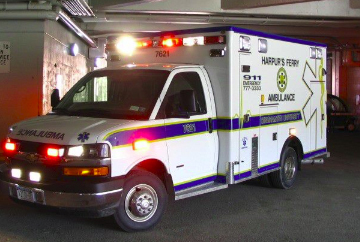 This is the first time Harpur’s Ferry will operate a fleet of 3 ambulances.